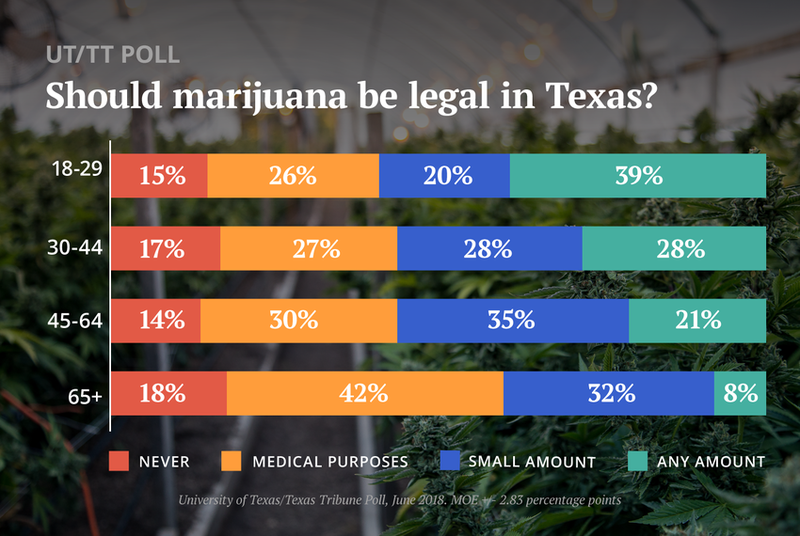 Most Texans are ready to legalize marijuana, but political obstacles remain, according to the latest University of Texas/Texas Tribune Poll. More than half of the state’s registered voters believe marijuana should be legalized in the state, according to the latest University of Texas/Texas Tribune Poll. Overall, 53 percent of the state’s voters would legalize pot either in small amounts (30 percent) or any amount (23 percent). Another 31 percent would legalize marijuana only for medical purposes. Only 16 percent said possession of marijuana should remain illegal under any circumstances. That majority hides significant differences. While two-thirds of Democrats would legalize marijuana for nonmedical uses, only 39 percent of Republicans would do so. Younger registered voters are more likely than their elders to support legalization. Only 40 percent of registered voters over 65 would approve legal marijuana, while 56 percent of Texans between 30 and 64 years of age and 59 percent of adults under 30 would end the state’s current prohibitions. Younger Texans might be pushing the issue, but age alone isn't driving the changes in public opinion. “We’ve seen this movement take place in a much shorter period of time than the age differences would produce,” said Josh Blank, manager of polling and research at UT-Austin’s Texas Politics Project. He noted that support for medical marijuana has remained relatively stable over several UT/TT polls, even as Texans' permissiveness has shifted from "never." Texans are open to legal betting on sports, an issue sparked by a recent U.S. Supreme Court ruling against a federal prohibition on such gambling, but large numbers are still undecided about the issue. While 40 percent of voters would legalize it, almost as many — 36 percent — were undecided. And there are significant distances between women’s and men’s attitudes. Only 29 percent of women said they would support legal sports betting and about as many — 26 percent — oppose it. The other 45 percent haven’t decided. A quarter of men were also undecided, but 54 percent said they would support legalized sports betting. Texans overwhelmingly support the death penalty for people convicted of violent crimes, but not as strongly as they did in a UT/TT Poll in February 2015. In the current poll, 65 percent of registered voters said they support capital punishment, down from 75 percent two years earlier. Democrats account for the shift: Where they favored the death penalty 61 percent to 32 percent in 2015, they are now split 46 percent to 42 percent. Republicans have hardly budged: 85 percent support it now, compared with 88 percent in 2015. Democrats are much more likely than Republicans to support allowing Texans to complete their voter registration forms online. Overall, 57 percent of voters like the idea, but that’s driven by the 77 percent of Democrats who support it. Republicans are divided, with 41 percent in favor and 37 percent saying they oppose online registration.